On June 7th, 2018, the “Small QR Code, Fun Marketing” convention, sponsored by Turbo Technology was held in Shanghai. Mr. Kai Hong, Chairman of JINGdigital, was invited to give a speech at this convention about the topic: “WeChat Marketing Automation, Make KPI Growth Visible”. A company by the name of Cloud technology is a long-term partner of JINGdigital. This collaboration will create new strategies for WeChat marketing in the future. At this event, Mr. Kai Hong introduced WeChat marketing automation technology and explained its ability to personalize experiences for users, while simultaneously reducing labor costs for brands. The guests in attendence clearly saw the benefits of marketing automation after they observed the data and examples provided in Mr. Kai Hong’s presentation. When WeChat marketing encounters problems, a technological upgrade proves to be the best solution. JINGdigital divides WeChat marketing into three stages based on brand maturity —Social 1.0: This stage only meets basic needs, such as event publishing, content marketing, and other basic functions; Social 2.0: build a data foundation, track user behavior, tagging and grouping using SCRM online, and data analysis; Social 3.0: based on pre-existing data, brands can implement personalized content and provide followers with real-time interactions. 4, The brand cannot keep track of and cultivate KOL with independent communication awareness in real-time. When a brand is still in the Social 1.0 stage, these four problems are very difficult to solve, but with the help of marketing automation technology and the upgrade of a brand to 2.0, followed by the continuous development to 3.0, KPI will show growth. For many years, the Savoy Hotel in London provided a 1:1 home-care service for every guest— customer service as well as a butler service. This is what gave the Savoy Hotel a reputation for being a luxury hotel. At the beginning of his speech, Mr. Kai Hong used this hotel as an example to explain the importance of personalized service to establish customer loyalty. Fortunately, due to the arrival of marketing automation technology, 1:1 personalized service no longer requires a large amount of manpower to execute. Brands that collaborate with JINGdigital reduce their labor costs, understand their followers in greater depth, and provide these followers with more personalized interactions, which will improve the brand’s KPI conversion rate. 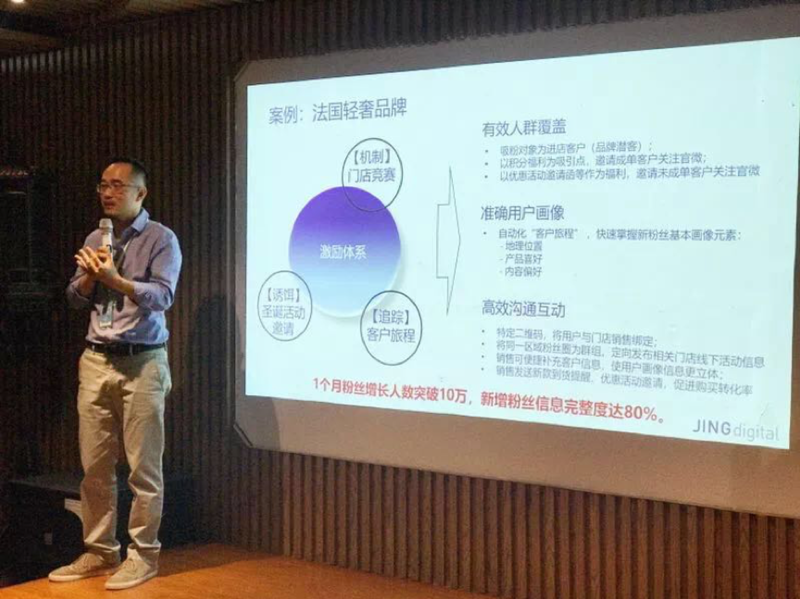 Mr. Kai Hong then explained how JINGdigital would analyze and solve the original four challenges: JINGdigital can help brands increase follower loyalty by using marketing automation technology. The welcome journey impresses followers, enhances their interactive experience, and produces a clear follower portrait, complete with customer product preferences, geographic location, and more. JINGdigital’s in-depth analysis interface, chat bots, personalized menus, O2O sales tools, and other functions, help the brand’s KPI grow. JINGdigital, China’s most successful WeChat marketing automation platform, provides digital marketing optimization solutions and helps brands customize content for individual followers, resulting in the improvement of purchase conversion rates. JINGdigital, which is also affiliated with Shanghai Zhuosuo Network Technology Co., Ltd., has an international team from all over the world that posesses deep insight into the dynamics of overseas digital marketing and China’s domestic market strategy. JINGdigital is continuously improving marketing technology to help brands achieve more success.